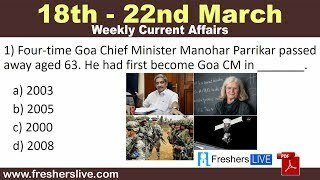 Current Affairs 23rd March 2019: Instantly obtain Latest Current Affairs 23rd March 2019 with all essential info, Be the first to know all the Current affairs 23rd March 2019 top news, Major Issues, Current happenings, Important events in National as well as International level with clear explanation. For all competitive exams and Interviews, equip yourself with the Latest Current Affairs 23rd March 2019 granted here. New Zealand imposed an immediate ban on assault weapons following the Christchurch massacre that claimed the lives of 50 mosque-goers. Prime Minister of New Zealand Jacinda Ardern announced assault rifles and military-style semi-automatic weapons would be banned with immediate effect, making a pledge to ensure that nothing like Christchurch massacre ever occurs in the Pacific nation again. About New Zealand Capital: Wellington Currency: New Zealand dollar. Fitch Ratings cut India’s economic growth forecast for the next financial year starting April 1, to 6.8% from its previous estimate of 7%, on weaker than expected momentum in the economy. The rating agency also cut growth forecasts for FY20 and FY21 to 7% from 7.3% and 7.1% from 7.3%, respectively. In football, India clinched the SAFF Women's Championship for the fifth time in a row, defeating hosts Nepal 3-1 in the final at Biratnagar. In the first half, Dalmia Chhibber of India scored the first goal of the match which was equalled by Nepal's Sabitra Bhandari at the 33rd minute. In the second half, Grace Dengmei scored the second goal at 63rd minute and Anju Tamang scored third and decisive goal in the 76th minute.